Today’s post will be a mixed bag. I have received so many great comments on my last few posts (thank you!!!) that I want to call out a few several for you all. In response to Frustrated, many of you commiserated with me on the process of fitting a pattern to our bodies. Phew! I am so glad that I am not the only one. Patricia linked to her sewing forum where she has tips and tutorials for fitting. Check it out! Several people recommended fitting books/videos like Nancy Zieman’s “Pattern Fitting with Confidence”, the “Fit for Real People” book, “Fast Fit” by Sandra Betzina, Peggy Sayer’s video (sorry no link) for fitting a muslin, and the G Street Fabrics book, “Customize your Sewing Patterns for a Perfect Fit”. I definitely have to get my hands on one of these references. Sue suggested joining my local ASG chapter which I have considered, but since I have challenges with childcare, it’s not an option right now for me. 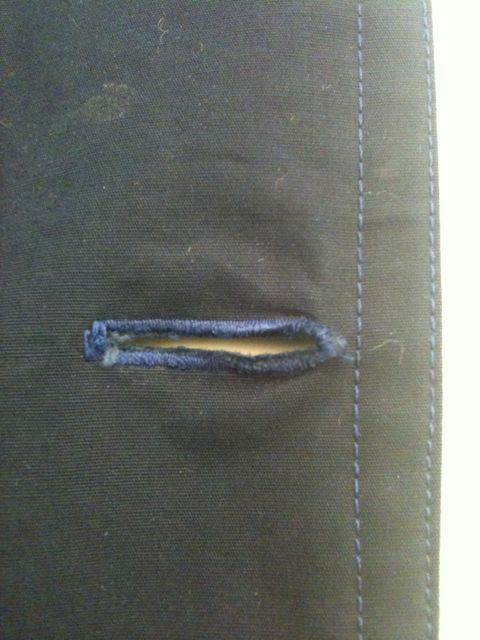 My post about how our home sewn clothes wear generated some good discussion too. But first let me post some pictures of my trench where I think it’s showing the wear and tear which prompted the post in the first place. 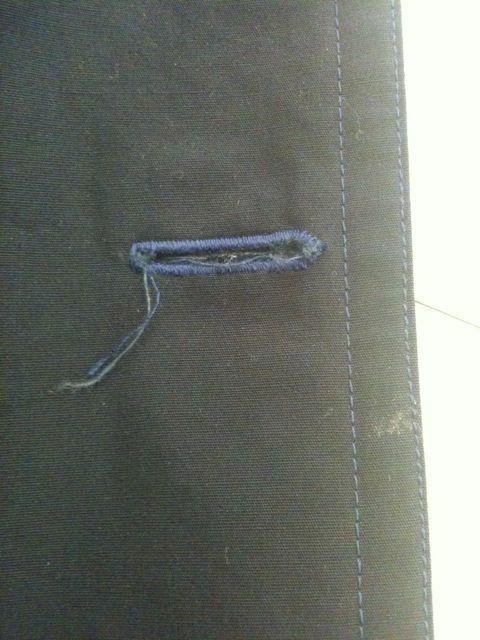 Some of it is poor hand sewing and some of it is lack of interfacing for the buttonholes. DOH! My mom suggested that I get my local dry cleaner to water proof my trench coat. Great idea. Thanks Mom! I didn’t know they could do that. Mary Nanna pointed out that as she became more experienced, the more durability she built into her clothes. I am noticing that already with my clothes. Sheila got me to thinking that I probably shouldn’t have used silk charmeuse as my lining in the trench coat as it is an item which will get much wear. Live and learn. *sigh* Wendy also commented on the trench saying that she interfaces everything in coats so they will last longer. Noted! Mary in FL asked which pattern I used for the red border print dress. Simplicity 3678 of course. The only dress pattern I’ve used yet (until this week). Toocutedobs mentioned that she’s not worn any of the clothes she’s sewn, but promised to do so last weekend. And I can report back today, that she did. Yeah!!! Heather said she also had a mental block about wearing her own sewn clothes. Heather, how about this weekend? Wanna make me a promise to wear something you’ve made like Toocutedobs? Peter admitted to wearing the same pair of jeans he made last August almost every day since. I hope they make it to the washer every once in a while. 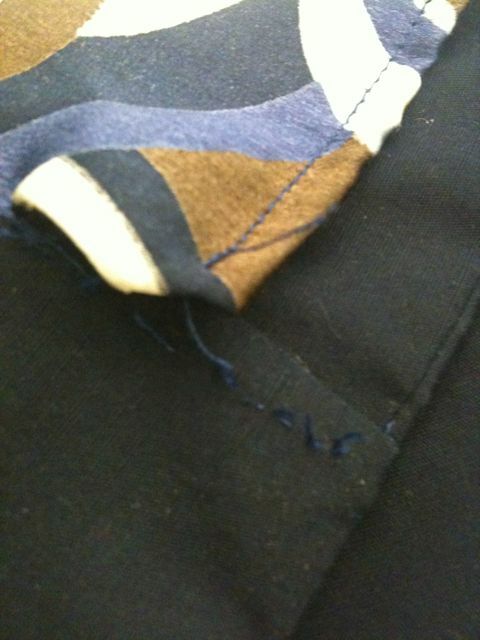 Sherry shared that she had a tutorial on her blog on using twill tape for waists when there is no waistband. Thanks! Evelyn offered some ideas for making clothes more durable like using your sewing machine after serging a seam to make the seam stronger and using twill tape on curved waist bands. My last post about taking the 30 minutes a day plunge came up with some great tips as well. Sheila takes her projects to work when they’re portable. Now that’s dedication. WOW. Darci says she sets herself up to start sewing right away the next time she’s at the machine, so she doesn’t spend precious sewing time prepping. I’ve done that several times before including last night and can vouch that it works. Not only does it set you up, but it stops you from sewing when you’re tired because you stop early enough in the evening to do the prep work the next session. A win-win situation! Trena mentioned something of which I suspected about the 30 minute a day method: that while you do make progress on your projects every day, you don’t get the high of making something in one long stretch. There’s no immediate gratification. And speaking of Trena, go check out her new vintage dress. It’s gorgeous!!!!! So, the last two nights I have been working on my DVF knockoff using Vogue 8379. I worked longer than 30 minutes each day which is what I was hoping would happen. Let me tell you though, Everything. Takes. So. Long. OMG! I guess I will get used to this process eventually, but for someone who’s always impatient, it’s such a pain to endure. But back to the wrap dress – I can tell already that I will be making this dress again and again (with some tweaks of course!). I even have plans to make it with my navy ombre knit that I bought from Kashi a while back. Oooooohhhhhh, I can’t wait (remember, I’m impatient). I feel a TNT coming on folks. Anyway, that’s my mixed bag post today. Hope you liked the round up. I’m not promising anything here, but I think I can finish it by Friday. Here’s to hoping! This entry was posted in 30 minutes a day, Beginner, Sewing, TNT's. Bookmark the permalink. Speaking as someone who is considered a prolific sewist, can I just say that I’m as impatient as you are. I constantly want things finished and finished now. I have to remind myself that it’s a process and to enjoy the journey. And finally yes, having TNT patterns and realizing which fabrics work best for you helps considerably in getting garments made quickly. But to attain that knowledge, I had to make the same journey that you are presently on. 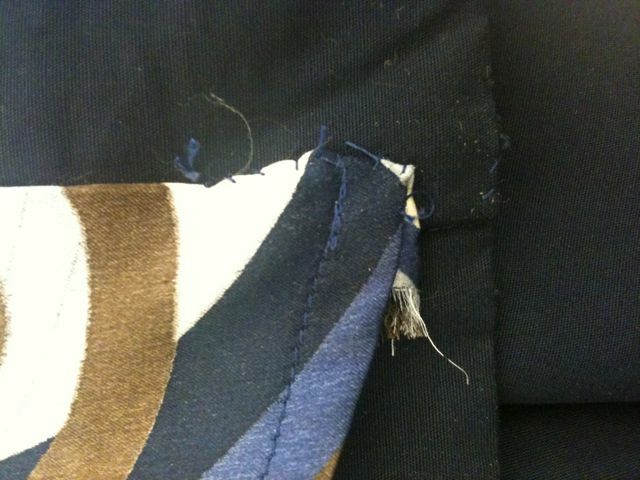 There are no tricks to becoming an experienced sewist…there is patience (uh-oh that word again! *LOL*), trial and error, the willingness to keep going and the thrill of accomplishment when things work out that prods you on. I believe that you have the ability to get where I am now but it is a step by step process. Don’t skip any of the steps and enjoy not only the accomplishments but learn from the failures. You can do this! I have faith in you! I’m sorry if these seems like a dumb question but I am new to sewing…What is TNT? I’m glad you’re giving the 30 minutes a day thing a shot. I find it better for utilitarian items (work skirts) than for fun stuff, but it does help me actually get things done…eventually. 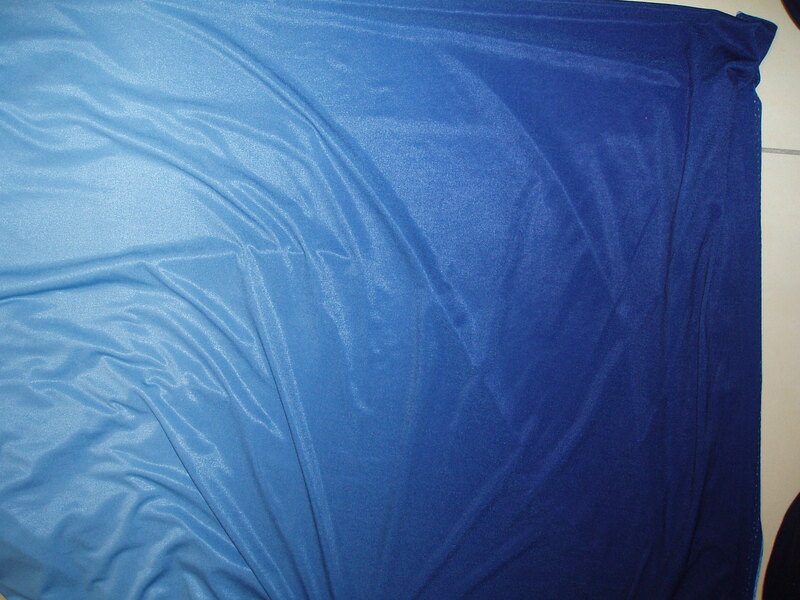 Like you and others I am also impatient during sewing, but slowly learning to take my time. Also spreading the construction over several days allows me to really enjoy the process. Also TnTs are my favorite, when I want instant gratification they are my go to source. Patricia, with Perfect Sew and Fit, is a god-sent to all of us so frustrated with fitting a pattern to our not-so-perfect bodies which of course no one has anyway). She is patient, has a terrific eye for spotting problems with the pattern fitting, and quick to respond to your requests for help. I have a new-found confidence in sewing for myself once again. I urge everyone to sign up for her “Sew 1 Garment a Month” classes and view her fitting videos on her website. Terrific help to those in need! Clear and specific individual help is afforded to all the members. Don’t miss out on this great informational/hands-on assistance. I can’t begin to say enough wonderful things about Patricia and her willngness to HELP others!!! !